A family moving into a new home with 2,000 to 3,000 square feet of space would pay $1,400 more in impact fees for a range of services Sarasota County provides if the County Commission adopt new sets of fees at the full, legally defensible levels supported by a recently completed study, the commission heard in a Dec. 9 presentation. County Impact Fee Administrator Beth Rozansky pointed out during the board’s regular meeting in Sarasota that the first study completed in eight years covering parks, libraries, fire protection, EMS, law enforcement, justice operations and general government services has been completed by the same consulting firm that worked on the 2006-07 study for the county — Duncan Associates, which has offices in Austin, Texas, and Chicago. Clancy J. Mullen, a principal with Duncan Associates, told the board this week that the biggest percentage change for a new single-family homeowner, determined by the study, was for general government services in the unincorporated areas of the county. That amount more than doubled, with a change of 158 percent. The second largest increase was for law enforcement services — about 66 percent. The current impact fee total for a single-family unit between 2,000 and 3,000 square feet is $4,397, Mullen showed the board in a slide. 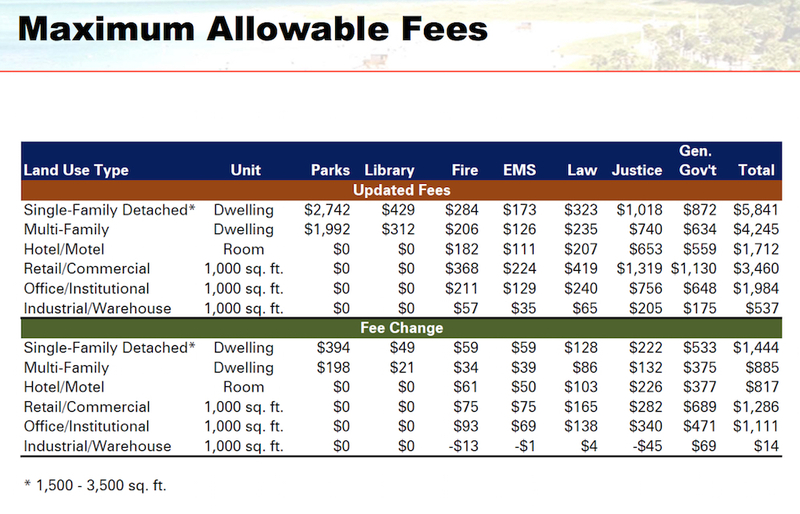 If the County Commission chooses to proceed with implementing 100 percent of the updated fees, the expense will rise to $5,841 for a house between 1,500 and 3,500 square feet, according to a chart Mullen included in his presentation. Duncan’s new study recommends reducing the number of single-family residential unit categories from nine to three. The current list of dwellings on which the county assesses fees lists sizes ranging from less than 500 square feet to 4,000 or more square feet. The updated fee schedule includes single-family residences that have less than 1,500 square feet; 1,500 to 3,500 square feet; and more than 3,500 square feet. Multi-family units should be assessed a flat rate, Duncan Associates recommends. The full impact fee for a new commercial structure of 1,000 square feet would rise from $2,174 to $3,460. Library and park fees are not assessed on commercial, office and industrial buildings or warehouses. The biggest part of the increase in the updated impact fee total for a new single-family home between 1,500 and 3,500 square feet would be pegged to parks — $2,742. The lowest figure, at its full level, would be $173 for EMS. “Building costs are significantly higher,” he explained, though “land costs came down significantly.” For this update, he continued, the study included all costs of construction, including site development and design. The latter factors were not part of the 2006-07 report, he noted. 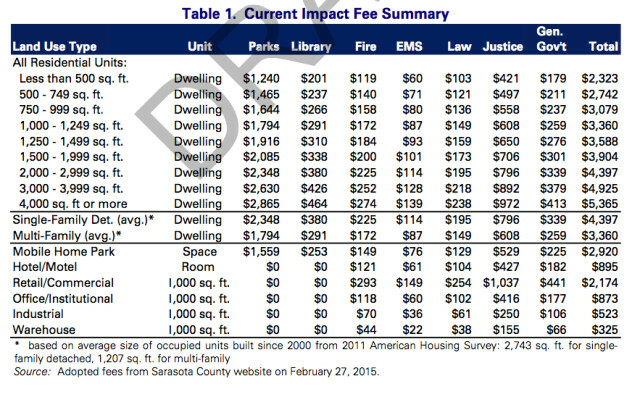 Among comparable counties, only Collier has a higher current impact fee total than Sarasota County — $6,679. However, Mullen pointed out, many of the counties reviewed for comparison purposes have not updated their fees in a number of years. Three of them — Hillsborough, Lake and Pasco — have not updated their impact fees in 12 years, he added. On the chart Mullen provided the board, the Manatee County fees — excluding any assessments for roads or schools — total $2,303. “These aren’t quite up-to-date for Manatee,” Mullen noted, as that county also has been working on a new study. 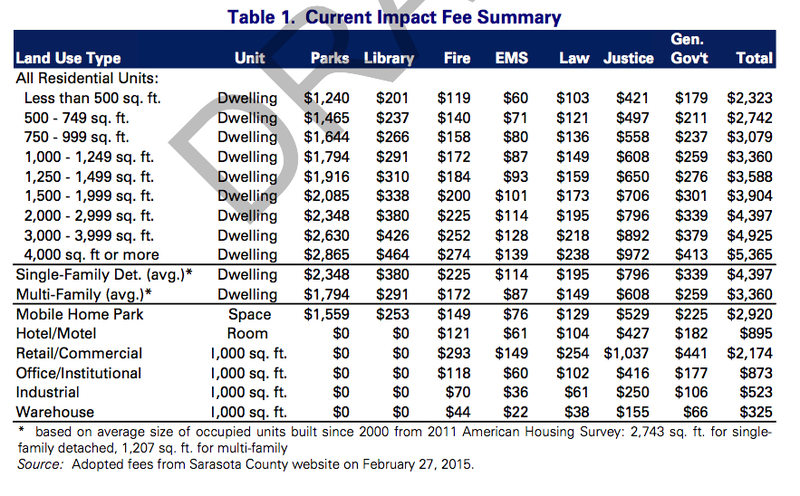 Additionally, Mullen explained, other counties do not necessarily charge all the fees imposed by Sarasota County. Moreover, Mullen said, three of the comparable counties have adopted fees at levels substantially lower than 50 percent of the full amount that can be supported by the studies behind them. This latest study for Sarasota County also encompassed a more extensive examination of the county’s park system, including neighborhood facilities, Mullen explained; those were excluded in the past report. However, he continued, his team recently realized it had not provided the necessary credit for the quarter-mill tax that county voters approved for the purchase of environmentally sensitive lands. Including that, he said, dropped the parks impact fee a bit. Another credit was applied for the Neighborhood Parkland Acquisition Program funding, Rozansky noted in a Dec. 9 email to the commissioners, prior to the presentation. In regard to the law enforcement part of the review, Mullen said the new study included the Central Energy Plant and the parking garage on Ringling Boulevard in downtown Sarasota. Those facilities were not part of the 2006-07 study, he noted. The net result is an increase of about 13 percent in library impact fees for a single-family home, he pointed out. Fire service impact fees are up about 26 percent — again, he said, because the study incorporated the full cost of construction of new stations, not just the expense of the buildings. For EMS, the same factors applied as with fire service, Mullen noted. Those fees are up about 50 percent. For Justice, the impact fee has climbed approximately 28 percent. 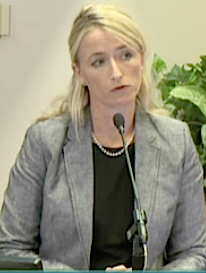 When Commissioner Robinson asked how affordable housing fits into the impact fee structure, County Attorney Stephen DeMarsh explained that, in the past, his office has advised that the County Commission has the power to pay part of the impact fee total for a new affordable home, so the family moving into it will not have to bear the full expense. 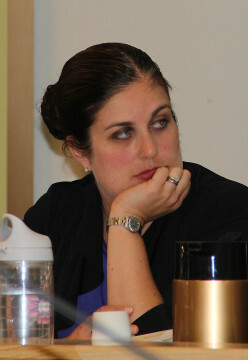 The board would take the money out of its general fund, DeMarsh added. 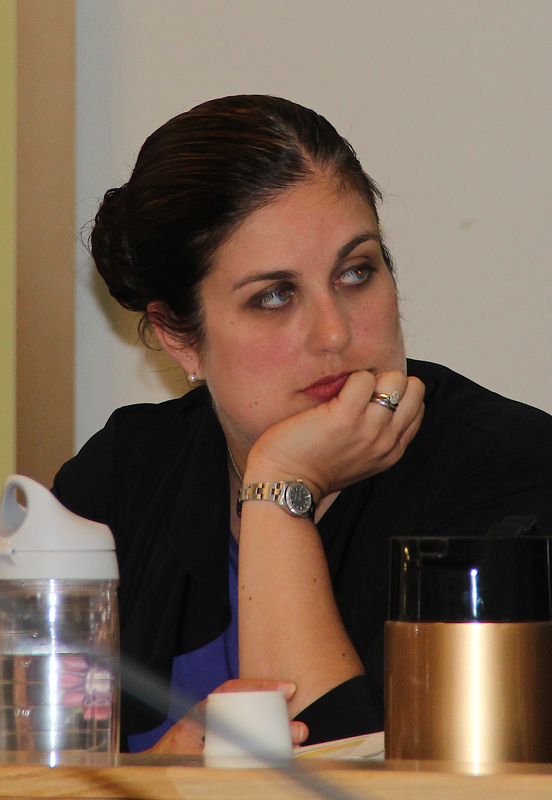 In response to a follow-up question from Robinson, DeMarsh pointed out that impact fees have to be charged uniformly; otherwise, the county could face a legal challenge. The only other option, he said, would be for the commission to reduce the fees across the entire schedule. “We would have to actually take from existing revenues to subsidize [affordable housing],” Robinson clarified DeMarsh’s comments. Commissioner Paul Caragiulo then asked Mullen whether he is aware of any jurisdictions that are using a formula to assign lower impact fees to homes with less square footage, as an incentive for affordable housing. Mullen replied that he believed some counties and cities in Florida probably “have some kind of exemption.” For example, he continued, some government bodies probably do not charge impact fees on Habitat for Humanity homes. Sarasota County does charges those fees on its Habitat houses, Vice Chair Maio pointed out. After the conclusion of the discussion, Robinson asked whether staff would be making presentations about the study to the municipalities. Rozansky replied that staff could do that, noting that each of the cities in the county collects impact fees among the seven types reviewed for the study, or, she said, staff could provide the information to them. 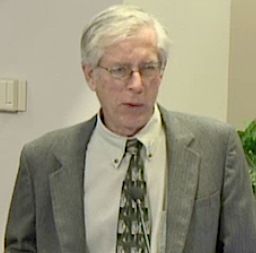 Because of recent turnover on some of the municipal boards, Robinson asked County Administrator Tom Harmer to have staff make the presentations and for that initiative to be undertaken prior to the commission’s vote on the updated fees.